We have excellent news! All ASIC miners are hashing and venting their heat into our newly constructed “Hot Box!” The addition of a hot aisle containment system to D-Node Hosting’s mining facility (aka "The Mint") prevents hot air from being recirculated through the miners. 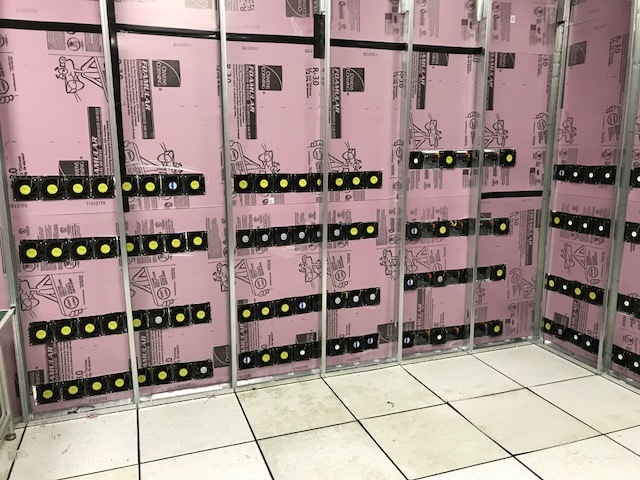 The exhaust ends of the Bitmain Antminer S9s, Bitmain Antminer L3s, and Bitmain Antminer A3s have been placed flush against the walls of the newly constructed containment area, and all hot air is exiting into the sealed off box. The ceiling tiles inside the hot box have been removed, which allows the exhaust fan to pull the hot air up and out through the roof. Now, only cooler air from outside the hot box is drawn into the miners, which will make all miners run more efficiently and extend their lifespan. Everyone at D-Node is beyond proud of our newest upgrade; there's nothing like seeing an idea come to life by the efforts of your own hands. In the coming weeks, we will have an open house, so our customers can check out the latest improvements to our mining facility. As always, our goal is to provide the best hosting service in the Dallas-Ft.Worth area. We thank you again for your patience during this epic upgrade project.